FROM JASON’S DESKTOP — Ferocious, living alligator-mobiles. Villages carved from hulking strawberries, onions, and loaves of bread. A steam locomotive roaring from the maw of a cavernous dragon’s head. 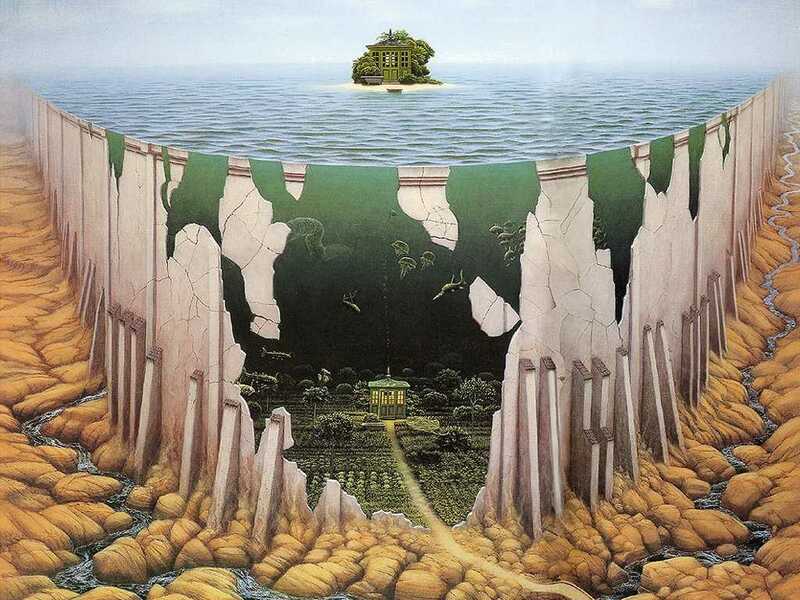 This is the mind of Polish fantasy artist Jacek Yerka. Yerka’s canvases are places where physics doesn’t give a damn about enforcing its own rules, where the mundane and the unlikely collide in a matter-of-fact way. Often, the paintings show two worlds living on top of each other — one recognizable and the other entirely alien. The result is that you start to doubt your grasp on the known; another land could be lurking a few yards under my feet, filled with goblins, unearthly cities, strange dreamscapes, and peril. It’s a nice thought to foster in this work-a-day world. Yerka, now 57, bucked his college art instructors, who wanted his style to fall more in the camp of loose and unstructured modernism. Instead, he insisted on elevating his neo-Dali-ism with exacting detail in the classical northern European tradition. The pieces are better for it. The composition gives incredible depth to each world he creates, while hinting that there’s even more lurking below the surface. He shows me so much that it causes me to imagine even more — which is what good art should do. FROM JASON’S DESKTOP — Maybe historians will call this The Summer of Nostalgia, or maybe I’m just getting to an age where I notice that everything old is new again. I’m talking about movies, of course, and (as usual) about the resurgence of the 1980s pop culture I loved so much (to the point of wearing Optimus Prime Underoos as a five-year-old twerp). This season sees a swell of iconic small-screen sensations at the cinema, with Star Trek, X-Men, Terminator, G.I. 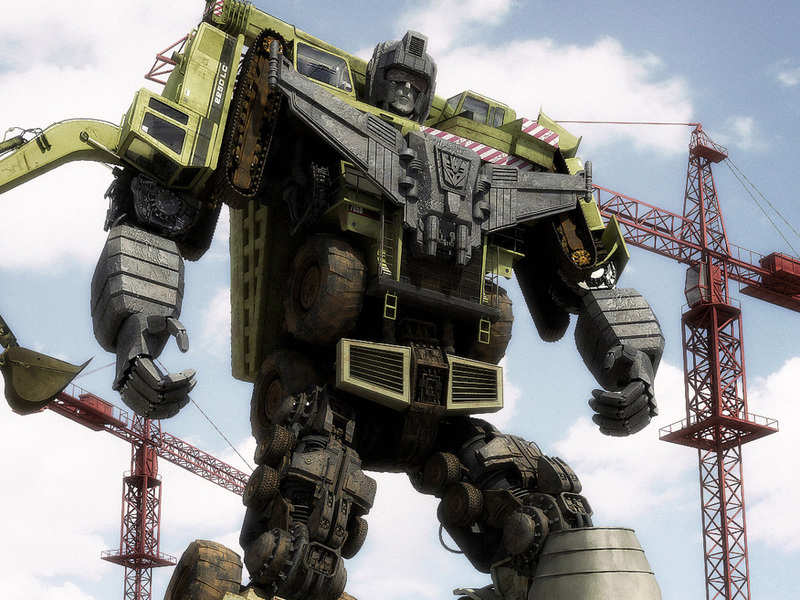 Joe, and Transformers getting franchise sequels and reboots. Fear not… The A-Team movie isn’t slated to launch until 2010. I’ve already talked about the one that I think will be the biggest nerd-gasm of the bunch — Star Trek — but I’m getting more excited as Michael Bay and company leak an increasing number of teasers and stills from the set of Transformers: Revenge of the Fallen, due out June 24. Don’t get me wrong. I normally cringe at Bay’s name because he’s all about popcorn and explosions rather than characters and plot innovation. 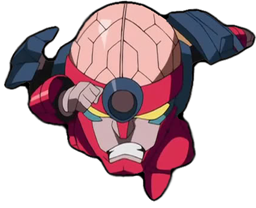 But giant robot movies aren’t about the later, and nobody should expect them to be. They are about enormous alien machines giving each other the smack-down and threatening the fate of Earth. Revenge of the Fallen will be about lasers and special effects. It’s not like the source material is a deep well of emotion that must be respected. So go Bay! 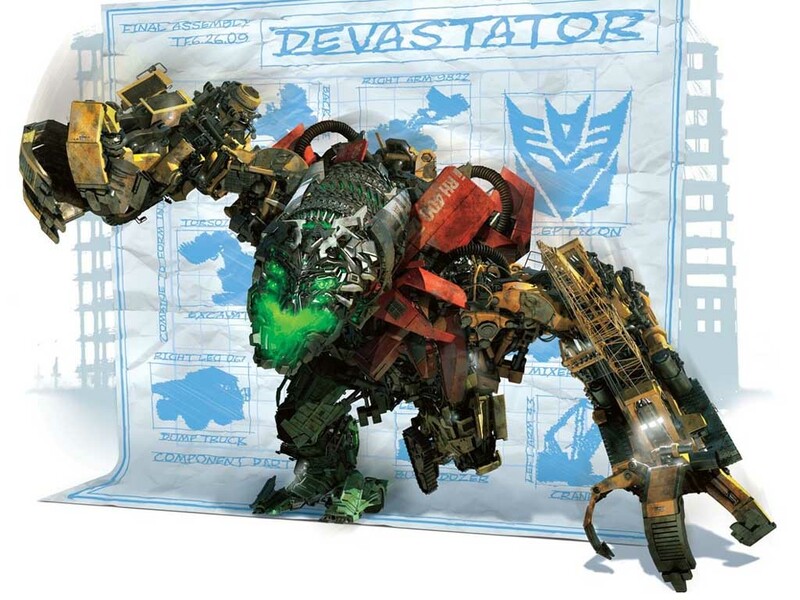 To rouse my enthusiasm, recent HD trailers for the film show the unmistakable form of Devastator, the giant combined robo-form of the evil Constructicons (see the very bottom image). I love seeing Devastator in the old Generation 1 cartoons. 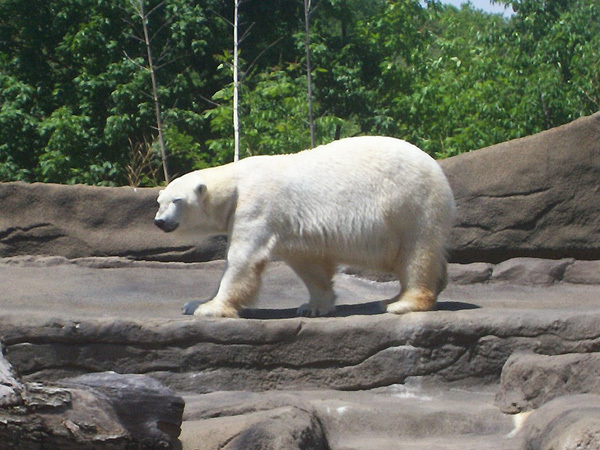 He was huge, lurching, animalistic and simple-minded as well as insanely powerful. He gave the Autobots a run for their money and shook up the internal Decepticon power structure. Plus, he boasted the same awesome baddy color scheme as the best of villains: Purple and green. 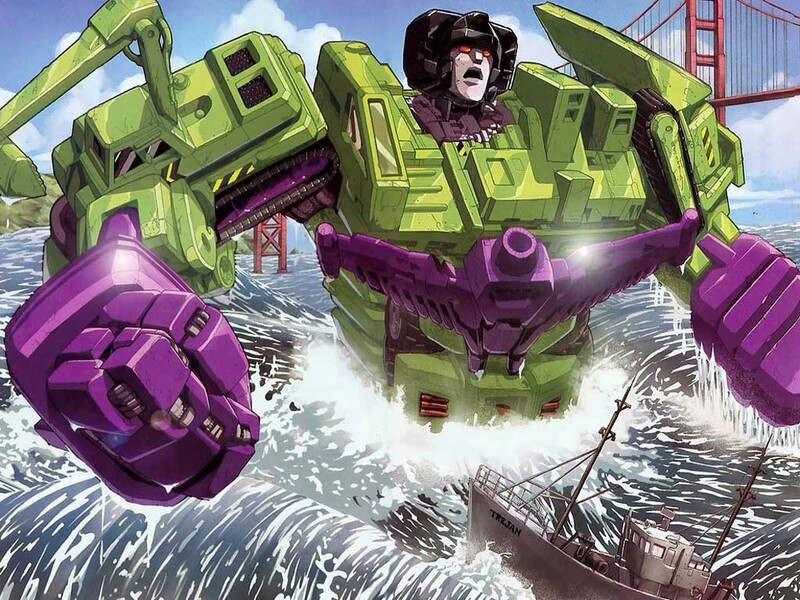 I never felt Devastator got enough love. The Joker stylings are ditched in RotF in favor of a more naturalistic approach, and it’s impossible to tell from the trailers whether he’ll get even as much screen time as Scorponok did in the 2007 iteration. Either way, I’ve packaged up a few Devastator wallpapers here for you. I had to go a-hunting, because there really are very few large-scale Devy images on the web — and right now, they are all mostly pointed at the RotF concept art desktop (above). As always, they are in 1024 x 768 resolution. Click the thumbnails in this post to enbiggen. You are currently browsing the Quaedam blog archives for May, 2009.